I wanted to post this a few days ago, but sometimes life gets in the way! I didn't pay much attention to this symbolic design on the monument for William Rawson (1861-1902) while visiting at Oakland Cemetery in Atlanta, Georgia. It jumped out at me once I got home and was reviewing the photos I had taken. Since I didn't get a close-up shot at the cemetery, here's a cropped view from the original photo. Screen capture. All images from Wikimedia Commons. The Templars did adopt a red cross on their white robes in 1147, but there was no specific style designated, and different Templars used different versions of the cross. The cross pattée was by no means their official symbol. However, some modern Freemason organizations do use the cross pattée in an official way, and this use occasionally causes confusion as to which version was used by the medieval order of Knights Templar. 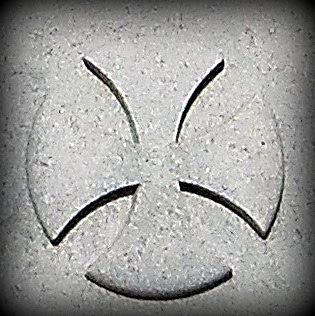 The Maltese cross looks like a + sign with flared ends that are usually indented to form eight points. These eight points represent the Beatitudes. It is often associated with such fraternal orders as the Knights Templar. Lastly, I saw mention of St. George's Cross (pictured at right). This is a red cross on a white background, also with ties to the Crusades. Supposedly, in Sweden and Scandinavia, the definition of a St. George's Cross is widened to include a "centred cross, normally red but not necessarily, with triangular arms that do not fill the square. Internationally this is often referred to as a subgroup of Cross pattée..."
After all this, I'm inclined to consider the symbolic design on William Rawson's monument as a simple Cross Pattée. Unfortunately, more research would have to be done on Mr. Rawson to know if there is any real connection between his life story and the cross depicted. I suppose it's possible the design is not a cross at all. What do you think? Would you call the design a cross? What kind?